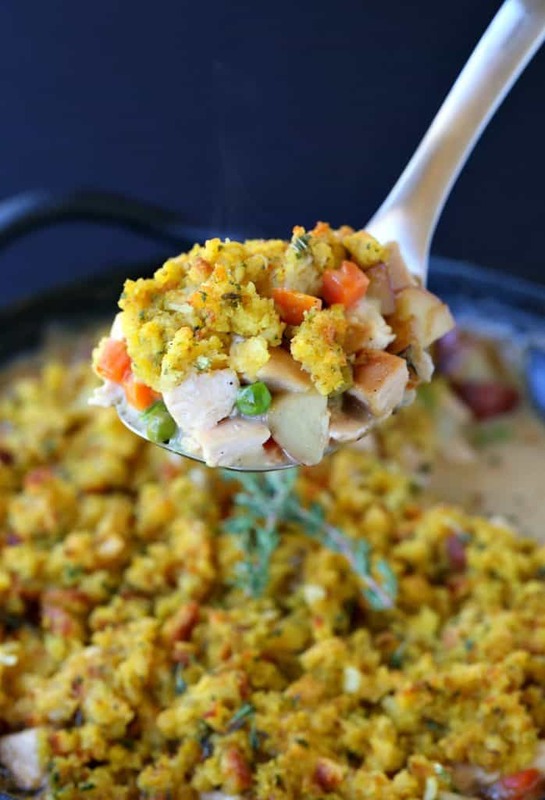 Make this Skillet Chicken Pot Pie with Cornbread Topping for an easy one skillet dinner. 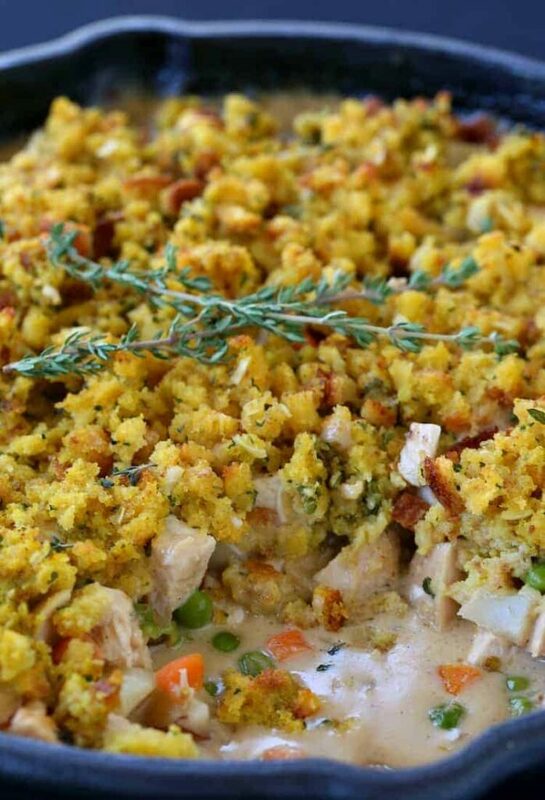 Use leftover chicken or turkey to make this dinner a breeze! Chicken Pot Pie is up there with one of my favorite dinners. Loads of chicken and potatoes – I guess you can throw some vegetables in there too – in that creamy, thick sauce…you really can’t beat it. I have to admit when we make chicken pot pie we always use a store bought crust. Back in the day Christie used to make it using this chicken pot pie recipe from scratch and it was really, really good. But no one has time for that these days and honestly, the store bought pie crusts are pretty good. But for this Skillet Chicken Pot Pie with Cornbread Topping, just like the name says, we used a cornbread topping. 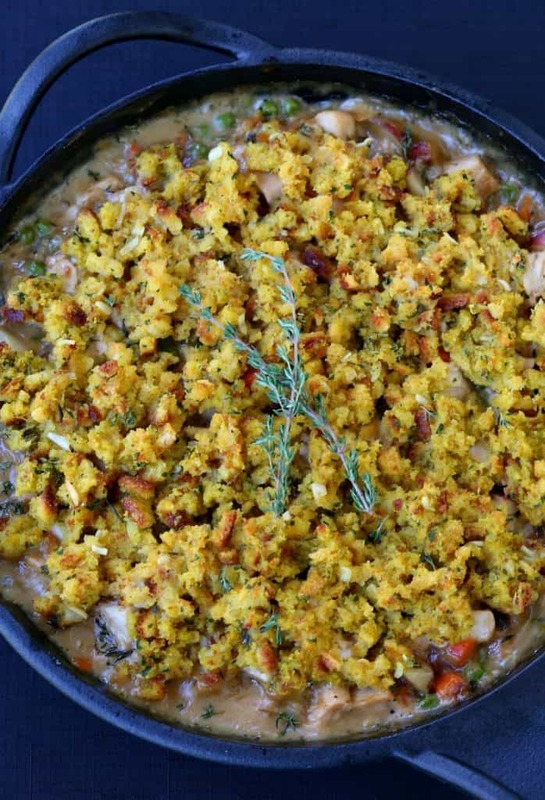 It’s actually cornbread stuffing – right from the box. 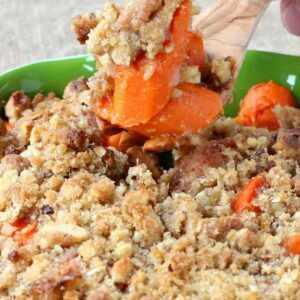 Now if you’re making you’re own stuffing, like we do all the time, you might have some extra Sausage Stuffing in your refrigerator that you can use too. Yes. I said right from the box. 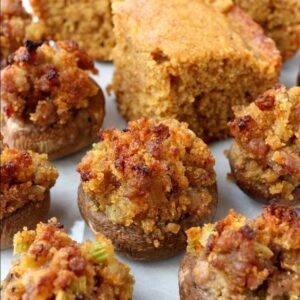 Of course if you have a cornbread stuffing recipe that you make all the time and love, you should definitely use that. But using the box and basically stirring it together with hot water and it’s done…it doesn’t get easier that that. And after you spread the stuffing onto this crazy good chicken pot pie filling and bake it until it’s crispy on top, you’re never going to remember that it was from a box. It’s going to be that good. Start out by roasting seasoned chicken breasts in the oven at 400 degrees. You can grab a rotisserie chicken from the store if you want to skip this step, that will work too. 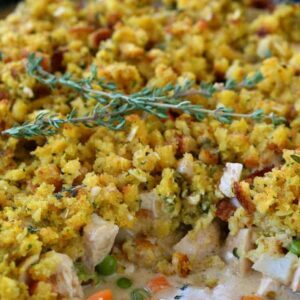 OR if you have leftover turkey or leftover chicken from dinner you made the other night, this is a great leftover recipe. Once the chicken is cooked, cut it into cubes and set it aside while you start the filling. 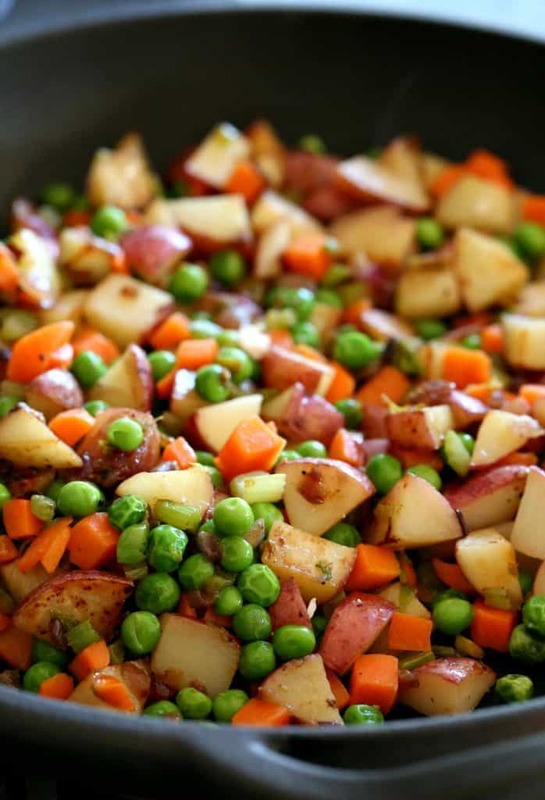 Basic chicken pot pie filling here, onions, celery, peas, carrots and potatoes. Chicken broth and heavy cream. The sauce actually gets thickened with flour but the cream is that gives it that rich, chicken pot pie flavor. So don’t leave it out. 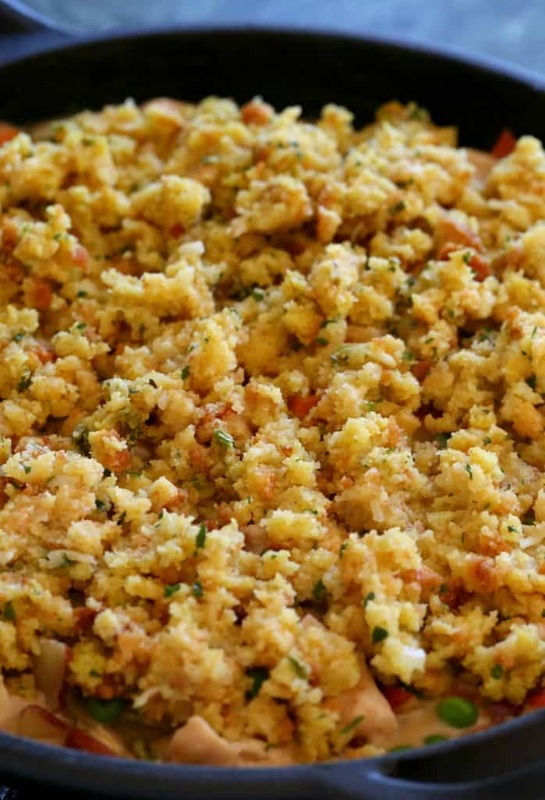 Then while the filling is cooking you can whip up that boxed cornbread stuffing mix. I know you guys all know which box I”m talking about…boiling water, stir and done. So do that, then spread the stuffing on top of the chicken pot pie filling and get it in the oven. Bake for 15 minutes until the topping is browned and it’s ready to serve! I mean there’s no one alive who’s going to turn this Skillet Chicken Pot Pie with Cornbread Topping down. 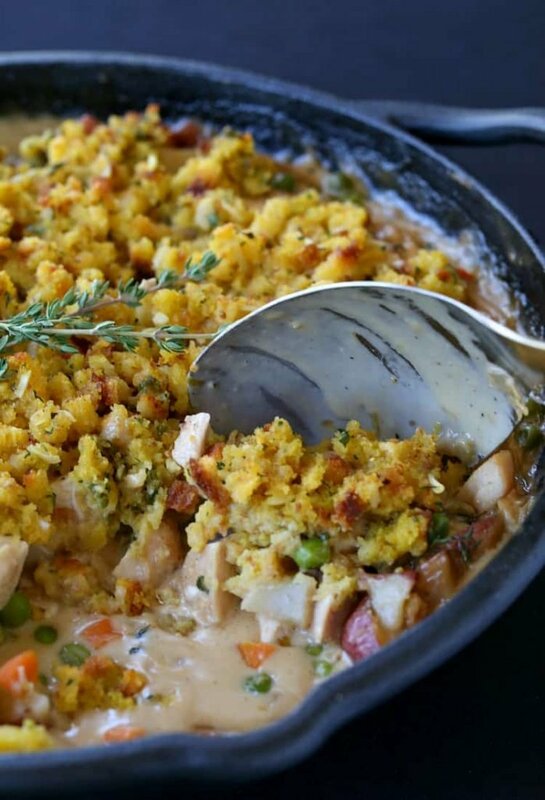 This delicious one skillet dinner uses store bought stuffing as a short cut! 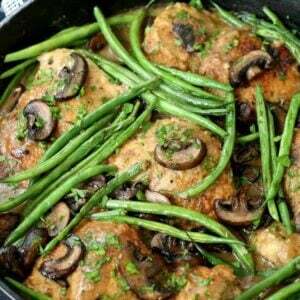 You can also use your leftover chicken or turkey to get this dinner on the table fast! Mix the seasoning together in a small bowl and season the chicken breasts on both sides. Place on a sheet pan lined with foil and bake for 30 minutes, flipping over once during cooking. Remove the chicken from the oven and let cool but keep the oven on for the skillet to go in at the end. Add the olive oil to a 12″ cast iron or oven proof skillet. Add the onion, celery potatoes, salt and pepper and stir. Cook over medium heat for 10 minutes then cover and let steam for another 5-10 until the potatoes are tender. Remove the lid then add the butter to melt. Sprinkle the flour over, stir and cook for 1 minute. Slowly pour in the chicken broth while whisking. Add the thyme and cream, stir then let come to a simmer for 5 minutes. Taste the sauce to check for seasonings then turn the heat off. Place the stuffing on top of the chicken filling, then bake for 15 minutes until the topping is browned. This recipe is a great way to use up leftover chicken or turkey – you can also grab a rotisserie chicken from the store to really save time! 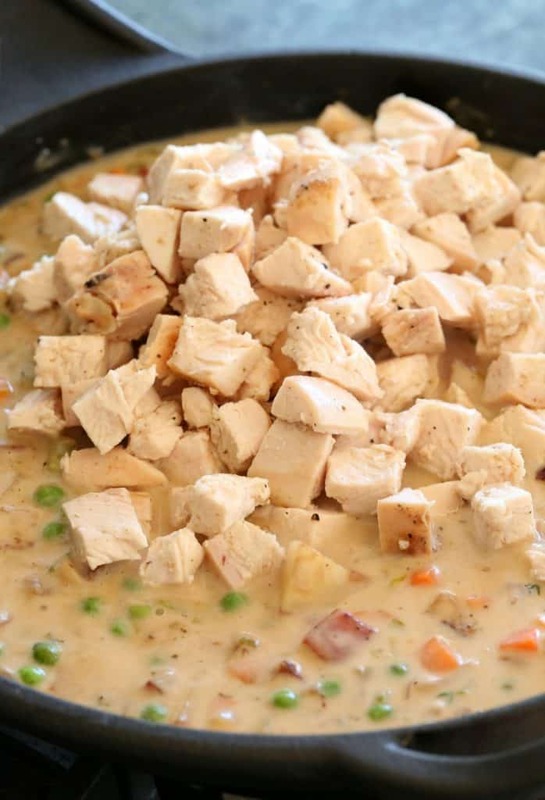 You’ll need about 4 cups of cubed chicken or turkey for this recipe.